A great meatless recipe idea, this dish is both delicious and easy. 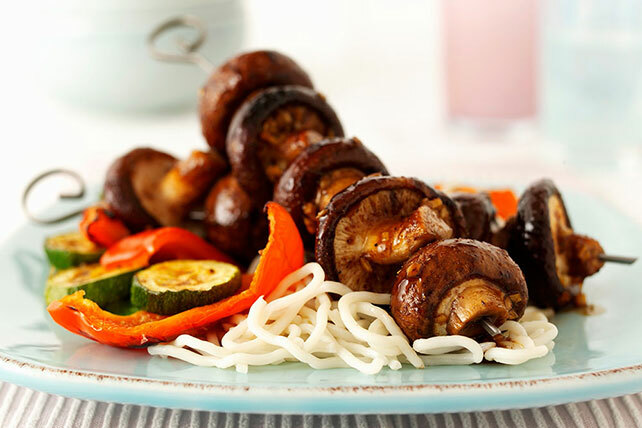 Grilled cremini and shiitake mushrooms, brushed with a sweet ginger-garlic barbecue sauce, are served with Asian noodles. Combine first 3 ingredients in small bowl. Thread 2 cremini and shiitake mushrooms alternately onto 8 skewers. Grill 12 min., turning and brushing occasionally with barbecue sauce mixture. Serve this dish with grilled zucchini and peppers. If using wooden skewers, soak them in water 30 min. before using to prevent them from burning on the barbecue.